Traditional potato candies, for some unknown reason called “Needhams,” have been enjoyed by Mainers for generations! You've probably never seen them mass-produced because candy made with potatoes, like other freshly prepared foods, should be enjoyed (or frozen) while still very fresh. Potatoes, which are low in FODMAPs, make it possible to use less sugar in these candies than in other fondants. Still, it best to stick to just one piece of this candy on a low-FODMAP diet. Grease a 5x9-inch loaf pan with butter or oil. In a small saucepan, cover the potato with water. Bring to a boil over high heat, uncovered, then reduce heat to maintain a simmer. Cook for 20 minutes or until the potatoes are tender. Drain, cool, and mash the potatoes with a potato masher or fork. Measure 1/3 cup of mashed potatoes into a small bowl. Stir in the confectioners' sugar, coconut, vanilla, and salt. The dough should be the texture of chocolate chip cookie dough. If it is a little too stiff, stir in another tablespoon of mashed potatoes, which will add moisture. Press the dough into a single layer in the prepared loaf pan. Cover and refrigerate overnight. The next day, cut the dough into 24 squares. Cover a baking tray or cutting board with waxed paper. In a microwave-safe bowl, heat the coconut oil and chocolate on high in a microwave for 30 seconds. Stir and repeat at 15-second intervals until the chocolate is completely melted and smooth. Working quickly, place each square of candy on the tines of a fork and lower it into the melted chocolate. Spoon chocolate over the top until the Needham is thoroughly coated. Scrape the bottom of the fork over the side of the bowl to remove excess chocolate and use another fork to slide the candy onto the prepared tray. If the chocolate starts to become too thick, reheat it as needed. 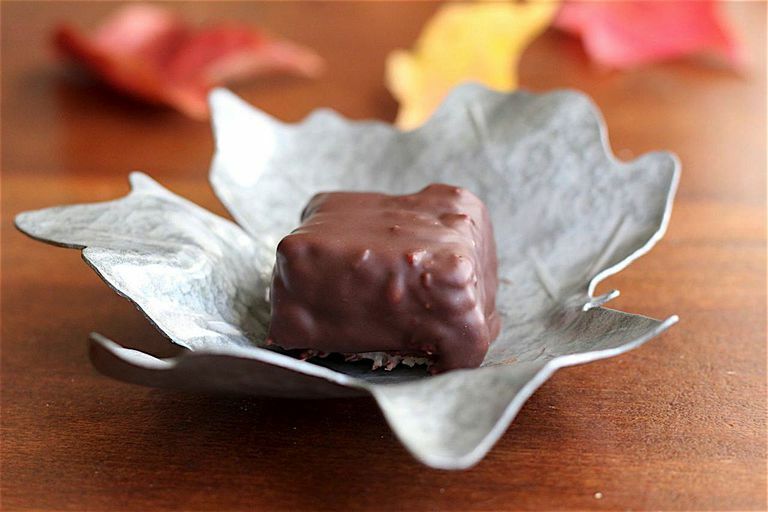 Chill the chocolate-covered candies until the chocolate hardens, at least one hour. Serve cold. Any chocolates that aren't enjoyed within 24 hours should be stored in the freezer in an airtight container. The amount of moisture in potatoes can vary depending on the variety, age, and cooking time. This recipe was tested with fresh Maine potatoes, which are a relatively thin-skinned variety with white flesh, and produce candy with a fresh-looking white filling.